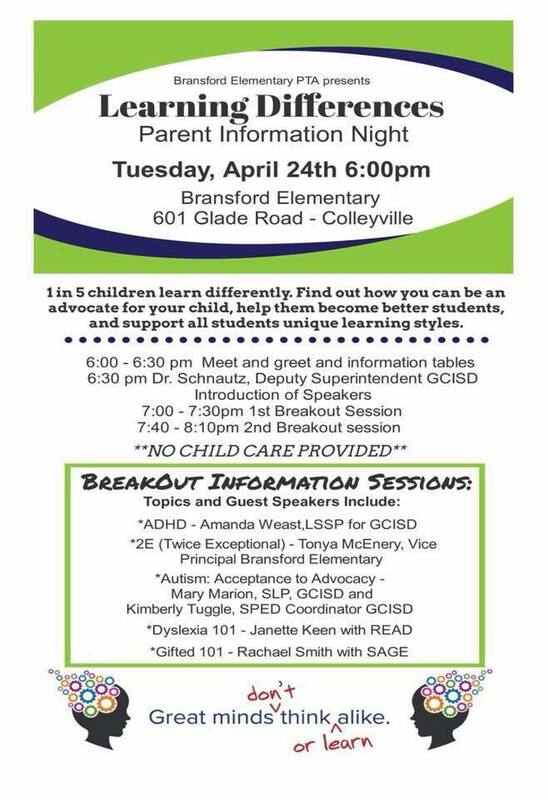 SAGE is pleased to be invited to present a breakout session about gifted learning differences during the “Learning Differences” event hosted by Bransford Elementary PTA on April 24. The SAGE breakout session will cover how gifted students learn differently, and talk about the difference between a high-achiever and a gifted learner. Our presenter will be SAGE member and GT parent Rachel Smith, master’s of education with counseling focus. SAGE President Kim Farbisz and SAGE Communications Chair and President-Elect Amy Warren will be there, too. The event is on Tuesday, April 24, 2018, from 6:00 to 8:10 p.m. at Bransford Elementary School. Other breakout session topics at the event are twice-gifted (2e), ADHD, autism, and dyslexia. The community is invited to this event. Childcare is not provided.